Rosie O’Donnell was pinning all her hopes on the “fake news” reporting the president would soon be gone thanks to Robert Mueller. Well, that didn’t happen. So, the hefty actress is having a major meltdown with a new wacky conspiracy theory claiming Trump “will be done” soon. That’s when she and her crazy new theory got destroyed. You’ll love this. There was no other celebrity so enthralled with Robert Mueller than Rosie O’Donnell. A voracious Twitter user, Rosie tweets continuously all day long, and for two years she has been informing her over one million followers that Trump would be in prison because Rachel Maddow said so. Well, when that didn’t happen, Rosie became unhinged. And like many deluded individuals, she grabbed on to anything that would alleviate her suffering. For the 57-year-old former co-host of The View, she was once again swayed by “fake news” even though those like MSNBC’s Rachel Maddow had proven to be wrong. It really is alarming to see just how deluded O’Donnell has become. The “fake news” outlets like CNN and MSNBC were shocked when AG Bill Barr released his 4-page summary of the Mueller findings. They had spent over two years promising their viewers Robert Mueller would definitely find Russian collusion and end Trump’s presidency. However, that didn’t happen. Quickly, rabid fans of the “fake news” outlets, including Rosie O’Donnell, demanded they come up with a new conspiracy to end their suffering. The new savior would become the Southern District of New York who is reported to have an ongoing investigation into Trump. Well, that’s what Rachel Maddow is saying, and Rosie is lapping it up. 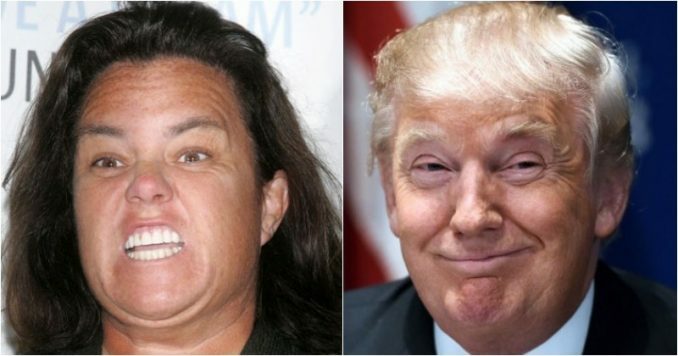 And O’Donnell is also hitching her wagon to Kamala Harris’ campaign, and says Joe Biden is “too old.” That’s all it took for Americans to weigh in on Rosie’s latest Trump delusion, and she got destroyed. More fake news from a out of touch pampered Hollywood elitist. Rosie stop perpetuating the false narrative of the main stream media. America can see through your relentless BS. Oh Rosie Bosie, you’re dreamin’. I realize that you don’t listen to God Almighty, but if you did, you would realize that Trump will serve 2 terms. Then Pence for 2 and yes, Pence’s VP, 2 more years… will you still be around??? “Don’t you just love the losers predicting defeat for Trump in 2020 when they were so sure he’d never be elected in the first place? They have no credibility and since those that promised to leave if he was elected, didn’t leave, they have not integrity either,” tweeted “4aFreeUSA” to Rosie. Don’t you just love the losers predicting defeat for Trump in 2020 when they were so sure he’d never be elected in the first place? They have no credibility and since those that promised to leave if he was elected, didn’t leave, they have not integrity either. Rosie is special. Many former Rachel Maddow cult members abandoned her show after being lied to for over two years about this ridiculous Russian collusion narrative. “MSNBC host Rachel Maddow lost half-a-million viewers in just one week after special counsel Robert Mueller’s report indicated that he did not find enough evidence to support collusion between the Trump campaign and Russia,” the Daily Caller reported. According to The Daily Beast, Maddow’s show dropped 500,000 viewers in just one week after the Mueller report dropped. But dimwitted Rosie wasn’t one of them. Instead, she chose to remain in her Trump-hating delusion and is continuing to tune in to the MSNBC host. It defies reason. The truth is it’s these conspiracy theories about the president that are “done.” Even though a few like Rosie O’Donnell remain obstinate and refuse to accept reality.